Continuous thirteen-hour trips on dirt and gravel roads; discrimination; years of difficult academic studies far from the community where she was born. These were some of the barriers which Ivonne Miranda, GOJoven International Fellow and co-founder of GOJoven Honduras, had to deal with on her path to academic and professional success. She dreamt of achieving these things since her childhood growing up in the Garífuna community of Santa Fe, Colón. Looking back, two events radically changed Ivonne’s life. The first was her ability to live and study for several years in La Ceiba and San Pedro Sula, without “following the pattern of life of the girls who go to the city.” Secondly, she believes that her work with GOJoven has led her to become a more self-confident woman who aspires to help her community and country through education and defense of the sexual and reproductive rights of vulnerable populations. Santa Fe, where Ivonne was born 34 years ago, is a community of Honduran Garífuna people who struggle to preserve their culture and beliefs despite the influence of cities and growing migration. She was uprooted there when her parents separated when she was only eight years old: “I was raised by my father’s aunt, but I spent one Christmas with my father and another with my mother,” Ivonne says. Unlike many Garífuna girls, who face the dilemma of whether or not to continue their education, Ivonne was determined to continue on and work towards achieving her educational aspirations. She knew that to achieve her dreams she had to emigrate to the city, like every young adult in Santa Fe who yearns for a higher education. In Ivonne’s family, no woman had ever graduated from university before. One of her uncles eventually became an engineer, but she was essentially a first-generation college student, a pioneer of sorts. Ivonne was 15 years old when she got off the bus in the city of La Ceiba, Atlántida, after thirteen hours of traveling on gravel roads, “with a suitcase full of dreams” and the desire to challenge fate. A few years later, she found herself working as a computer technician. “I liked computers,” she says, remembering with a smile the day she went to college for the first time, “but according to the tests, I wasn’t meant for a technical career. Rather, the results pointed me towards a career that involved interaction with people.” She challenged her luck again by studying Psychology. “Education changed my life and significantly turned it around,” says Ivonne. As it turns out, it changed not only her life, but also her family’s. “My younger relatives are inspired by my sacrifice and perseverance to not give up on their own paths,” she says. (Her family follows her example well: both her cousin and sister are also psychologists). When she was studying at La Ceiba, she decided that she would only return to Santa Fe if she had a university degree. And she did not stop there: “In my family, I am the first to get a Master’s degree,” she adds proudly. Deciding to take yet another risk, she went to San Pedro Sula after completing her Master’s degree, where she faced discrimination from her teachers and the violence of a large city. In her second job working with HIV-infected populations in a clinic for teenagers, the staff talked to Ivonne about the GOJoven Program. The program piqued her interest, and she decided to take part in a 10 minute interview that ended up being a 45 minute conversation. “I thought something was wrong,” remembers Ivonne. When they told her they saw her as a leader, she could not believe it. “I never saw myself that way,” she says. “GOJoven marked me. It sensitized me, helped me to better address sexual and reproductive health, and funded my Master’s studies. It is a stage that marks a before and after in my life. With what I learned through GOJoven, I now help to influence the youth of my community.” Regular access to Santa Fe remains difficult, especially in the winter when the rivers’ water level rises and there is no bridge to cross, but the work of committed people like Ivonne helps to reduce the gap between youth and their right to information despite this challenge in reaching the population. “Thanks to GOJoven, I became a leader in sexual and reproductive health. One of our projects was to create kiosks and host educational fairs where we gave young people information and distributed 11,000 condoms.” Her youth-focused work has also crossed national borders. Last year Ivonne traveled to Colombia to give a presentation on behalf of GOJoven. In Colombia, they were amazed to learn about her past thirteen-hour trips and that as a Garífuna with higher education, Ivonne was able to preserve her mother tongue. 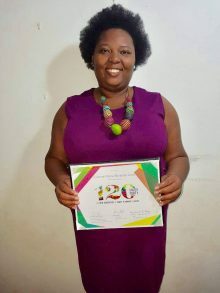 Most recently, Ivonne was selected for the prestigious “120 Under 40: The New Generation of Leaders in Family Planning,” an initiative of the Bill & Melinda Gates Institute for Population and Reproductive Health at the Johns Hopkins Bloomberg School of Public Health. This global award recognizes and highlights Ivonne’s achievements as a member of the next generation of planning leaders from around the world. The selection process was very competitive: 40 winners were selected in 2017 through an electronic public voting system, evaluation by a jury of experts and leaders in the field, and approval from the Project Secretariat. As an award-winning young leader, Ivonne received $ 1,000 from the Bill & Melinda Gates Institute for Population and Reproductive Health to continue her family planning work and / or to start new innovative projects. With the prize money, Ivonne is funding a project to prevent school drop-out with the help of young people from the GOJoven platform. GOJoven International is committed to supporting Ivonne in this new international space, including for the execution of her Seed Fund award. 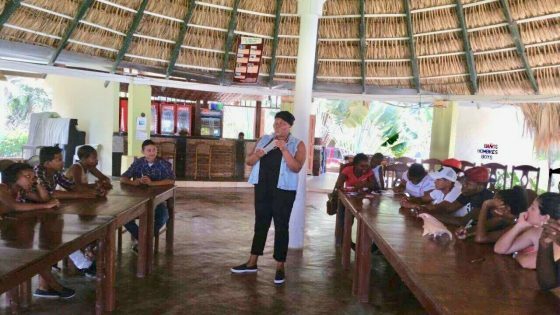 This article is the second in a series of two articles produced by the author, Dunia Orellana, about the women leaders of GOJoven Honduras. It is a special series dedicated to National Women’s History Month, March 2018.